With mobile-optimized online accounts, plus our SDS / Chemical Management mobile app, you can access safety data sheets, scan container QR codes and manage inventory information wherever you need to, from any mobile device—online or offline. Our SDS / Chemical Management app syncs directly with your MSDSonline HQ or HQ RegXR Account, allowing you and your employees to view critical chemical information and save it to your mobile device for offline use, and to manage your chemical inventory across locations. With the SDS / Chemical Management app, effective chemical management has never been more convenient. 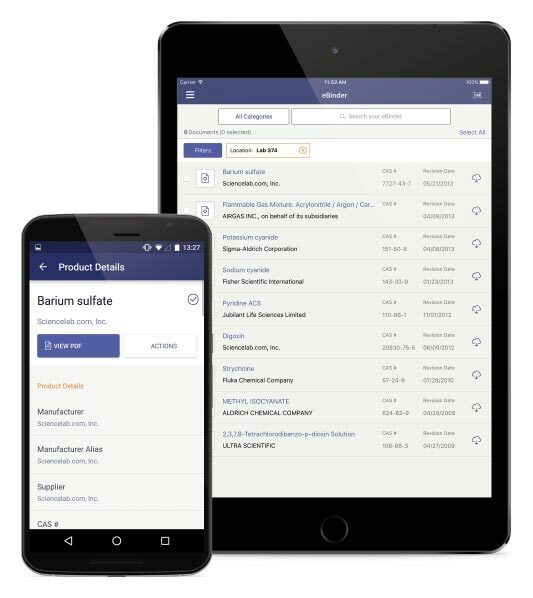 Use our SDS / Chemical Management app for convenient access to safety data sheets, product details and chemical inventory management tools whenever and wherever you need them. Chemical safety management occurs both in the office and in the field. Gone are the days when hard-copy binders of material safety data sheets and spreadsheets of chemical products were the only and best way to access key chemical information. Today, more than ever, technology is playing a larger role in streamlining chemical management processes. When it comes to inventory and safety information, speed-to-access is critical and supports rapid decision-making, which translates into safer, more productive work environments. OSHA’s adoption of GHS has changed the landscape of workplace labeling and safety data sheet management, and compliance with its GHS-aligned HazCom Standard has garnered greater attention from covered employers and OSHA enforcement officers alike. As a result, employers need to be equipped with smarter, mobile-ready tools for managing chemical inventory information in order to stay ahead of compliance. VelocityEHS has responded. Our award-winning cloud-based MSDSonline products are mobile optimized to help you and your workforce access critical chemical inventory and safety information anytime, anywhere and on any device—from a desktop to a laptop, tablet or smartphone. And our SDS / Chemical Management mobile app makes it even easier for you and your employees to have safety information at your fingertips, whether online or offline. What’s more, our mobile-ready Plan1 First Responder Share Service lets you proactively share up-to-date, potentially lifesaving hazardous chemical safety information from your HQ or HQ RegXR Account with first responders, making it available to them via a mobile device—which is perhaps the fastest, most convenient way to retrieve the information during an emergency. The world may be getting smaller, but we've just made the impact of mobile chemical management on your workplace that much bigger. Simplify hazardous chemical management and compliance from the field with MSDSonline’s mobile technology. Convenient Access to Chemical Information – Our online accounts are mobile optimized, and our SDS / Chemical Management mobile app—available for free download on the App Store® and Google Play™— makes it possible to access SDSs and chemical inventory information offline, when internet connectivity is limited. With these mobile capabilities, critical chemical safety information is always at your fingertips. Enhanced Chemical Management – Robust chemical management tools, including our chemical mapping feature, give you greater container-level control over the location, status and risks associated with chemical products in your facility. Plus, the SDS / Chemical Management app makes it possible to quickly scan container barcodes, QR codes and UPC codes to retrieve and manage container and other chemical inventory information from the field.